50¾" (129 cm) bust circumference and 25¼" (64 cm) long. 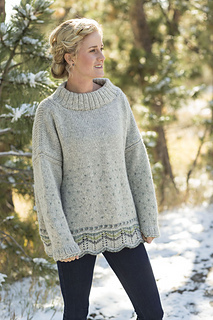 The Elsa Sweater is knitted in the round from the bottom up, and all the decorative techniques used to construct the sweater have been inspired by traditional Nordic knitwear and in particular mittens and gloves. 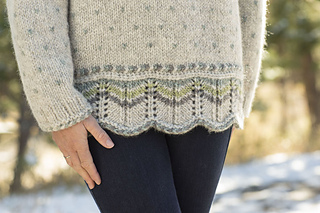 The sweater has a decorative two-color folk cast-on, a wavy scalloped border often found on mitten cuffs, classic Estonian nuppiline stitches, and a colorful vikkel band. 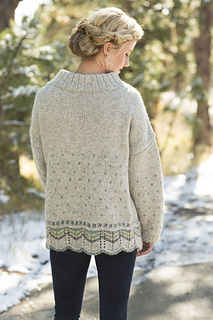 All these techniques, combined with rows of classic lice stitch, give this sweater an unmistakable Nordic look. 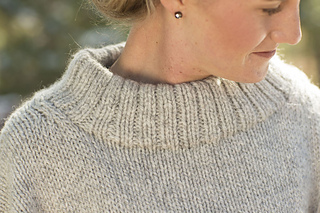 Traditional steeks are incorporated as you knit, which are then reinforced and cut to make the neckholes and armholes. It is important that a pure wool yarn is used for this project as, once completed, steeked garments must be washed in warm soapy water to ensure the reinforced and cut stitches are secure. 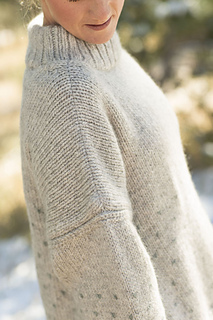 The generous, oversized proportions of the sweater, combined with a chunky pure wool yarn in a soft and subtle color palette, create a superbly cozy and cosseting sweater that is ideal for indoors or out. Size U.S. 9 (5.5 mm) two 16” (40 cm) and one 32” (80 cm) or longer circular (cir) and set of 5 double-pointed (dpn). Adjust needle size if necessary to obtain the correct gauge. Markers (m); holders or waste yarn; size 2 mm (no equivalent; between U.S. 1 steel and B-1) crochet hook; tapestry needle.